NOTE: In an effort to deflect any legal action unnecessarily taken against me I have changed the band name in this article to PartyMix. Any likeness to any artist or person, except myself, is a pure coincidence. I work with the Portuguese band PartyMix. I started a Facebook group in response to their online content being systematically removed following aggressive trademark infringement complaints from the Italian band Party Mix. The group is open. Anyone can join to weigh in on the debate, share stories, rant, rave, etc. The group is named after the Abrams Image book by Bart Bull. Should a band name dictate control of all web content? I have a personal connection with the Portuguese PartyMix created by Francesco Russo. I recorded his self-titled album and helped with his first music videos. One of these videos I uploaded myself to YouTube and Vimeo. Imagine my surprise when, earlier this year, I received a notice from both sites explaining that my videos would be taken down because of complaints of copyright infringement by another Party Mix from another country. I submitted the required forms. The videos remain down. The PartyMix Myspace page has also been removed. My question is: Should a band name dictate control of all web content? I understand the importance of trade marking and musicians should treat their band like a business, but is PartyMix really cutting into the global profits of PartyMix? Is this sort of aggressive territorial activity really necessary? I happen to like both bands. Their music is highly contrasting and probably has few common fans. Should one be forced to change its name and risk loosing a chuck of the business they worked so hard to build up? My feeling is that both bands should focus more on growing their local fan base and less on online territorial battles. People are going to keep starting bands and as the world gets smaller they will bump into each other more often. So here’s to a peaceful coexistence and the enhanced entertainment of us all. How many bands do you think exist called The Outsiders? We’ve all had the experience of searching for a band on MySpace to discover that there are several hundred versions and variations of the same. 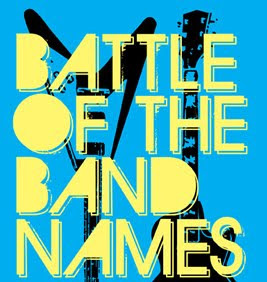 This year The Wall Street Journal publish an article called, From ABBA to ZZ Top, All the Good Band Names Are Taken by John Jurgensen. Many a musician has encountered this problem. You work hard to start a band, write music, and rehearse later to find out that the name behind your creation has been taken already. There are various methods for researching names, but not all are documented and some people are just careless. If your doppelganger is a tiny unknown group in Slovakia, who cares, but a well-known active band in your area might not want to share. My first band in high school was -IX (Negative Nine). Later we found out about another band called Minus Nine. Whoops. My next band was Sang-Froid. There are at least two other bands with that name in the world. I started to get more creative by using foreign languages and eventually settled on Zé Dos Frangos. There are plenty of restaurants with this name, but show me someone else who wants a band with such a crazy name!? There are plenty of stories out there of mistaken originality. Share yours! this is the second time I write to you in reference to my artistic name and registered trademark “Party Mix”. You must know that from February 2, 2011 I complained to the State Police – Department of State Police and Communications here in Milan for Lombardy against Francesco Russo for his unlawful use of my trademark Party Mix and for the crimes of aggravated defamation of my person Adriana Ricci . For all above reasons I require as once to you for the cancellation of your unauthorized PartyMix’s blog published in your website at the following URL: http://www.nathanlively.com/category/trademark full of untruths and slander about the origins of my artistic name and registered trademark. Please stop to use the name Party Mix also in his variants Party Mix / PartyMix/ PARTYMIX. in reference to me and in reference to Francesco Russo (and any tag in photo you made using my name) from your website with the purpose to get visibility in the web. I reserve the right to take against anyone will support all the unlawful conduct built by Francesco Russo every necessary step, even to the court, to protect my rights and compensation for damage. As you can see, there have only been two visitors from Italy. One of theme must be you and the other is a first time visitor who only stayed on for 2 minutes. Do you really think that that one person seeing my post is destroying your career? If you are really interested in making a living as an artist, stop focusing on attacking other artists and start focusing on making great art. That being said, you obviously feel very strongly about this whole matter, so if you can send me proof that you own the US copy right to the trademark “Party Mix,” then I will take down the post that you are referring to.